Interview with Professor Débora Barretto. Welcome to the fourth installment of Interviews with Latin American Acousticians. You can find the previous interviews at https://acousticstoday.org/interviews-south-american-acousticians/. Our interviewee of this installment is the Professor Débora Barretto from Brazil. Her profile focus is in the construction industry as well as in academia. Professor Barretto is an architect and holds a master’s degree in engineering of urban environments and noise pollution and a specialization in building acoustics. 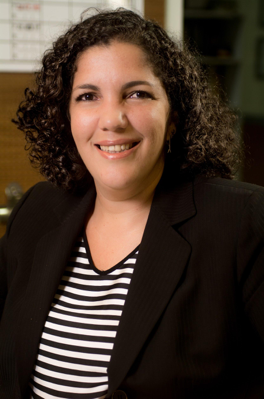 She is the director of acoustics of a company that focuses on audio, acoustics, and lighting and she also coordinates a post-graduate degree in Environmental Comfort and Sustainability at Unime, Kroton in Salvador da Bahia. She is quite involved in societies and standardization related to acoustics in Brazil. Citations of some of her publications are at the end of this interview. Ernesto: Hello Professor Débora Barretto, it is a great pleasure to interview you. Welcome to the section Interview with Latin American Acousticians of Acoustics Today. Ernesto: Where are you from? Professor Débora Barretto: I am from Brazil, a country recognized for its great riches and natural beauties and that now also begins to have a growing recognition in the area of acoustics. This growth is a proof that our scholars and our professionals are increasingly interested in offering the market more practical and viable solutions, in an efficient and safe way. Ernesto: What were your beginnings with acoustics? Professor Débora Barretto: When I enrolled in the faculty of architecture I was very interested in acoustics. And so I became a fellow under the supervision of the professor of the subject of acoustics. I have always been interested in the effects of sound on materials and people, and mainly on sound propagation in the environment and in the cities. Another topic that I always loved was the dramatic and musical art. That’s why I found in acoustics a way to gather some great dreams and challenges. My dream of knowing the world, recognizing the importance of sound in diverse types of societies and cultures, and the challenge of developing that topic in my country. While I was a student I had the opportunity to work for AUDIUM, a company that develops acoustic projects. There I could learn and grow a lot applying the knowledge of my studies of specialization at the Technical University of Madrid (UPM) and master in engineering of urban environment and noise pollution at Escola Politécnica da Universidade Federal da Bahia. I always liked learning something new. Since 2005, I have acted as technical director of AUDIUM. Today I travel a lot to know the best that exists in acoustics, I visit factories, I make technical visits, and I participate in internal congresses. I humbly bring to my country all this knowledge and I put myself at the service of the academic community and the market to offer the best acoustic solutions. Ernesto: Before studying architecture, what did motivate you to go into architecture and acoustics? Professor Débora Barretto: Before studying architecture, during school I always liked the disciplines of calculus and technical drawing. I saw that physics could explain all the phenomena I knew. Mathematics was inspiring for me because of the challenge of solving equations. I loved technical drawing because of precision and possibilities of creating. All these things conducted me to a profession that associated the technique with aesthetics and for that reason I work on architectural acoustics. Ernesto: Would you briefly comment on the most outstanding projects in which you were involved? Professor Débora Barretto: I am blessed to had the opportunity to develop professionally both in academia and business. As director of acoustics of AUDIUM, I am in charge of projects such as the International Broadcast Center – IBC of the Olympic Park located in Rio de Janeiro, Rio Mar Shopping Malls, several emblematic restaurants in the capital of Bahia that receive tourists from all over the world with noticeable sound quality, great museums such as Cais do Sertão (PE), Museu da Gente Sergipana (SE) and Jorge Amado House Museum (BA), Theaters, Churches and Offices throughout the country and consultancies for the new Standard on Performance focused on residential buildings. There are many projects, let me comment on three of them with different types of environments. The first is Shopping Rio Mar de Recife (PE). This is the largest food market in Latin America, it is possible to converse without vocal effort, as well as listen to the ambient music. For that environment, we specified diverse materials, with perforated plaster as the main material. This mall obtained the AQUA-HQE environmental certification and the acoustic comfort was fundamental in this process. It was the first mall in Brazil to receive this type of certification. We also developed, in collaboration with the architecture studio AFA to use curved baffles that associate lighting with acoustics. Second, let me mention the Theater RM Fortaleza (CE). In this theater, we made an aesthetic relationship between the ceiling and the wall by means of complementary forms of wood materials that were simulated in the software EASE. We also designed acoustic diffusors and specified Wenger® acoustic clouds for sound reflection. It is a big theater where it is possible to listen without effort even from the last seat. And last, the Auditorium of the headquarters of Odebrecht, one of the largest construction companies in Brazil. This venture was certified Green Building LEED. It composes a large complex with multiple auditoriums, restaurants, and offices. It was a project where we learned a lot because acoustic issues were present from the beginning and they were mandatory for all the other disciplines. By this I mean that acoustics was at the center of technical and aesthetic solutions. It is currently a reference of environments with acoustic comfort that is extremely elegant and harmonious. In Audium, we have an extremely committed and competent team and the outcomes are a result of collective work. A special project has made me very happy: the development of palm fiber acoustic pieces performed by quilombola communities in Bahia. All the elaboration of the ideas is ours, and the management of the project is under the responsibility of a local University. In the academic area, I teach “Acoustic Comfort” in the undergraduate architecture course. I coordinate a post-graduate degree in Environmental Comfort and Sustainability at UNIME / KROTON. In our company, we are developing a pioneering initiative in Brazil, offering practical and dynamic courses of short duration for specific audiences, involving acoustics professionals, professionals in architecture and engineering, and students. I am part of the first group of professionals certified by the Brazilian Society of Acoustics (SOBRAC). Ernesto: How is your experience with acoustic groups and societies? Professor Débora Barretto: I actively follow the activities of the local associations since I began on acoustics. I have been associated with SOBRAC since 2002. I started my most direct participation in SOBRAC in 2013 when I was elected as a senior director in the management of Dinara Paixão. Currently I am in my second term as vice-president (the first whith Newton Soeiro as President and now under the presidency of Stelamaris Rolla). It is a joy to represent my country at the organization’s international events and meetings. From the Brazilian Association for Acoustical Quality (ProAcústica), which is a new association founded in 2011, I have been a member since the beginning, with the permanent position of founding Director. In addition, my company, Audium, has been associated since the formation of ProAcústica. Today I am also part of the board of directors of the current management. Also in this context, I actively participate in the technical committees of the Brazilian Association of Technical Standards (ABNT) and contribute in the revision and development of standards in acoustics. My undergraduate degree was in architecture so I also try to relate to my colleagues in my profession, because my specialty contributes to our professional activities. In this context, I decided to accept the invitation to be a member of the Board of Architects of Brazil (CAU) in Bahia Department. Ernesto: Would you share your vision on the international aspects of acoustics? Professor Débora Barretto: The acoustic market has been growing all over the world, as a response, mainly, to the problems of the modern world. Human activity, be it industrial, business, educational, or even leisure and entertainment, produces noise. Current life requires dealing positively with sound, taking advantage of pleasant sounds and minimizing negative impacts of noise. Furthermore, today’s world already understands that sound is a fundamental part of human existence. Therefore, the quality of life improves by dealing with sound responsibly. I am grateful that I can actively participate in transmitting awareness of the power and the importance of acoustics. It is actually a gift to be able to share knowledge with professionals from around the world, either through participation in events or while accompanying the development of new techniques and materials. Globalization is very relevant as regards to the democratization of information, aiding the definition of local public policies that consider future demands, based on the experiences of other cities. In dealing with acoustic issues globally, all mankind wins because it is possible to develop effective ways of dealing with the sounds produced by human activity. Ernesto: Thank you very much Professor Débora Barretto! Barretto, D. M. and Freitas, I. M. D. P. (2008). Importância de mapas de ruído na análise do planejamento dos transportes [Importance of noise maps in transport planning analysis]. In: XXII Encontro da SOBRAC, 2008, Belo Horizonte, Brazil. Barretto, D. M., Souza, D. and Brito, P (2010). Aplicabilidade de SIGs para mapear tipologias e fenômenos urbanos que caracterizam o comportamento da acústica ambiental [Applicability of GIS to map typologies and urban phenomena that characterize the behavior of environmental acoustics]. In: XXIII Encontro da Sociedade Brasileira de acústica, 2010, Salvador, Brazil. Ferreira, M., Carvalho, M. L. and Barretto, D. M. Utilização da planilha Isotrafe 1.0 para análise de edificações marginais a uma via de tráfego [Use of the Isotrafe 1.0 worksheet for analysis of marginal buildings on a traffic lane]. In: TecniAcústica, 2011, Cáceres, Spain. Paim, F. P., de Souza D. F. M., Barretto, D. M. and Ferreira, M. S. (2016) Acoustic quality in shopping malls for environmental certification. Case studies: Shopping malls RioMar Recife (PE) and Fortaleza (CE). In: ICA / FIA, 2016, Buenos Aires. Barretto, D., Souza, D., Cavalcante, K., Castro, A., Castro, D., Nascimento, C., Paim, F., Pereira, L., Rosaneli, V., Santos, L. (2017). Atividade pedagógica enquanto agente transformador dos espaços de ensino: avaliações acústicas de salas de aula com e sem condicionamento acústico [Pedagogical activity as a transforming agent of teaching spaces: acoustic evaluations of classrooms with and without acoustic conditioning]. In: XXVII Encontro da SOBRAC, 2017, Brasília/DF, Brazil.